English windows, also referred to as sash windows, are radically different from their standard European counterparts installed in buildings in most countries on the continent. Sash windows use a completely different opening system – an up-down sliding movement. What are the advantages of this solution? Is it worth considering? To find the answers, read our guide, which is a first one in the series: “Windows from the world”. Box sash is a popular industry term for a window opoened in that slides vertically. Both sashes of a window can be arranged asymmetrically, one or both sashes can slide. Windows of this type offer interesting decorative options, and as such are suitable for use in traditional or historic buildings as renovation windows. English windows are used as a standard in the UK, Ireland and Anglo-Saxon countries, for example in the United States. First of all, sash windows are perfect for small rooms. If every additional square inch of surface area matters, it is definitely worth choosing English windows. It eliminates the problem of tilting or turning which requires a lot of space to be opened all the way. This makes it possible, for example, to put a wardrobe in the immediate vicinity of a window, or place a slightly higher desk under the window. It also frees up more space on the windowsill. The extra space can be used, for example, for desk accessories, which do not need to be taken off each time just to open the window. Undoubtedly, English windows have very impressive and elegant appearance. They fit perfectly into rustic or classic interiors and can be further decorated with elements such as muntins or horns. As a standard we made sash windows in the wooden frame technology. Counter balances usually consist of cords and weights. Weights (usually made of lead, steel or cast iron) move up and down within a concealed box in the window frame. The box often includes a spacer to separate the paths of the weights so that they do not collide with each other. Aikon Distribution also offers spring-operated sash windows. Where box sash window is counter balanced using springs (selected depending on the weight of the window). There is a stereotype that English windows are not suitable for European climate, which is obviously not true. 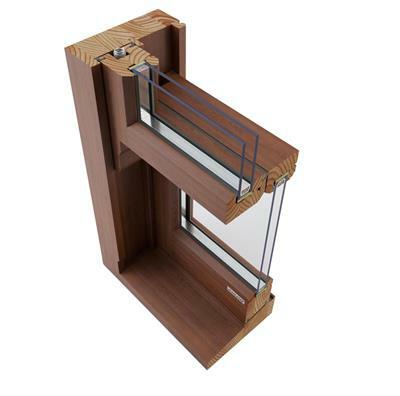 The heat insulation parameters of a wooden frame are very similar to that made of PVC. It is really easy to achieve an Uw coefficient of 1.1 W/(m2*K). To sum up: English windows are a very appealing solution that can be successfully applied not only in Anglo-Saxon countries. We particularly recommend our sash windows for rooms which, due to their limited wall and floor area, require a specific layout – including kitchens or bathrooms. Sash windows – click and find out about the offer.